Abrisa Technologies offers high throughput efficiency wide angle, broad spectrum sensor and laser scanning window solutions for visible 425-675 nm (VIS), visible to near infrared 425-1050 nm (VIS-NIR), short wave infrared 700-1800 nm (SWIR) and popular laser and LED wavelengths from 405 to 1550 nm. These window solutions are designed for image sensors and scanners and may be used in industrial 3D metrology, machine vision, automotive obstacle avoidance, security and surveillance, document scanners, 3D scanning, gesture recognition, and other digital imaging applications. 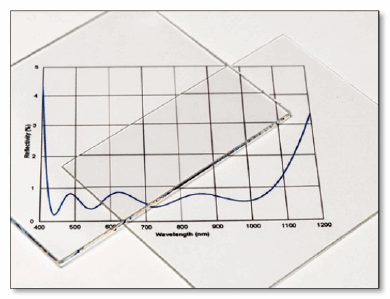 With a combination of performance coating design and volume glass fabrication, Abrisa Technologies also provides coated solutions for both laser line and broad spectral ranges from visible to SWIR. Spectrally selective coatings for outdoor or discreet diode emitters are also available. Download the datasheet for additional information on the features, specifications, and performance characteristics of these window solutions.